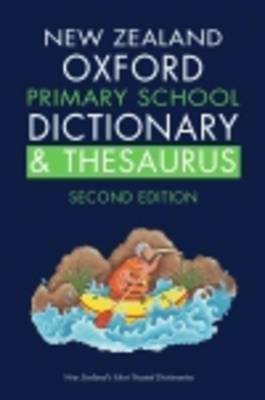 The New Zealand Primary School Dictionary & Thesaurus is written for 10-12 year olds and is a fully integrated dictionary and thesaurus. It assists students to develop and extend their knowledge of words and definitions as well as build world power by supplying an extensive list ... read full description below. The New Zealand Primary School Dictionary & Thesaurus is written for 10-12 year olds and is a fully integrated dictionary and thesaurus. It assists students to develop and extend their knowledge of words and definitions as well as build world power by supplying an extensive list of synonyms. Now fully revised with many new features, this dictionary and thesaurus is the essential reference resource for upper primary school students. AGE LEVEL: 10 to 12SUITABILITY: Upper primary school studentsCOVERAGE: Over 7000 dictionary/thesaurus headwordsKey features:Up-to-date content: updated to contain many new words that reflect cultural and technological changes.New Zealand English: distinctive New Zealand words and meanings are included, and a labelled accordingly.MAori: guidance is given on MAori pronunciation and plural forms.Pronunciation: simple pronunciation guide for difficultor unusual words.Appendices: comprehensive coverage of grammar skills, useful words from te reo MAori, texting and instant messaging language, along with shapes and angles.